Visiting local markets is an experience that most of us enjoy when we’re travelling. Markets are a great way to explore the local culture and make some great purchases. This one, the Maeklong Market, is a must if you’re visiting Thailand. 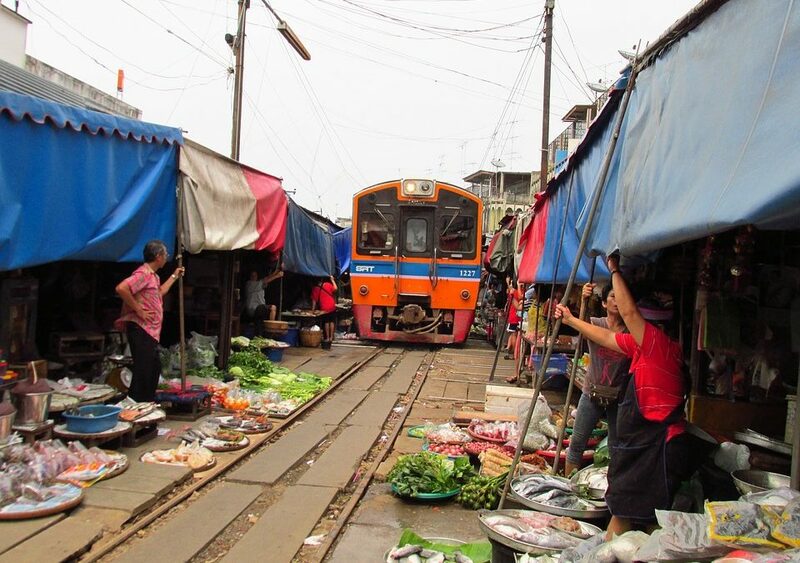 The wonderful thing about this market is that several times a day, seven days a week, a train drives straight through the market stalls. And I don’t mean that the market stalls are yards away – they are so close that the stallholders have to remove their goods from the track and let down their awnings. See the video below to see the stallholders in action and a train going through. The stallholders have this to a fine art. Stalls are on wheels to that they can be quickly pushed back. Awnings can be moved in seconds. The market was there before the railway line was built in 1905. And for all those years, this famous seafood and produce market has lived alongside the railway tracks. As you can see from the map below, the market is located south-west of Bangkok. One reviewer on TripAdvisor called the market a ‘once in a lifetime experience’. See more reviews and photographs here. Looking for a quiet and relaxing time in the sun? Here’s the place for you. This one bedroom apartment is located right on the water – can you imagine yourself sitting on the dock, watching the boats go by, enjoying the sunshine and sipping a tropical drink? Fort Lauderdale has so much to offer for your vacation and this delightful Mid-Century Modern apartment is the perfect base for enjoying it all – yet it gives you a quiet haven from the hustle and bustle of this busy and vibrant city. Your apartment is located in a small complex of just a handful of apartments – it’s the one you can see in the photograph above, upstairs on the right. See the catwalk? That’s a wonderful place to sit and enjoy your morning coffee. What’s more, the apartment is situated in the well-known Las Olas area – and area renown for it’s wonderful dining options, eclectic boutiques, galleries and museums … and is only five minutes away from the beach by car or cab. You’re even welcome to bring your pet. The apartment has fabulous views, is decorated in style and – essential in South Florida – it has full central air conditioning. You’ll find good strong wifi and all the amenities you’ll need whether you’re travelling for business or for fun. 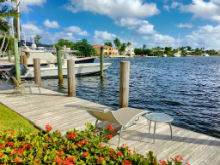 Close to the beach and all Fort Lauderdale has to offer. Jackie is the onsite manager of the wonderful apartment and will be on hand during your stay to make sure that you have everything to need. She is originally from the UK and has lived in South Florida since 1994. She is the founder and editor of JAQUO Magazine.